Reservations are required for group tours. Contact us at least one week prior to your desired tour date to ensure a docent is available. Our trained guides will lead your group through all five levels of the mansion and the first floor of the original slave quarters following our 12-minute introductory video. ​Tours may also be customized according to focus and time constraints. Call us at (910) 251-3700 or email info@bellamymansion.org to reserve your tour today. Check out our "Plan your Visit" page for additional information about visiting the Bellamy. 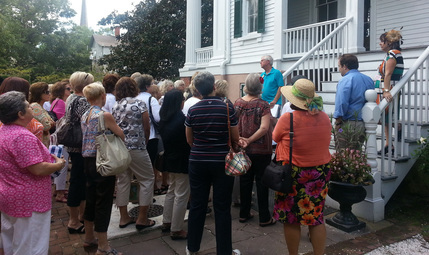 ​Groups of fifteen or more qualify for a group tour admission fee of $9.00 per person. This price does not reflect applicable sales tax. Please note the mansion and slave quarters are not handicapped accessible, but we do offer a 30-minute video tour of the mansion from our accessible Carriage House Visitor Center for any visitors with limited mobility. School groups qualify for a group tour admission fee of $4.00 per student. Teachers and bus drivers accompanying the school group tour are not charged for admission. Chaperone admission fee is $9.00 per person. These prices do not reflect applicable sales tax.